Although it has been talked about since late September I just got my complimentary copy of Typography Sketch Books by Steven Heller and Lita Talarico (New York: Princeton Architectural Press, 2011) today. So I apologize for being behind the curve. My six pages show sketches, proofs and notes for my Origins, Kolo and Donatello typefaces. (The former was a custom typeface for Origins, the cosmetics firm, and is not available for general sale.) The book is not limited to sketches for typefaces though it does include work by Matthew Carter, James Montalbano and Erik Spiekermann and a few other type designers. Most of the work is by illustrators, letterers and graphic designers. The roster of names is wide-ranging: Charles Spencer Anderson, R.O Blechman, Art Chantry, Ivan Chermayeff, Tim Girvin, Milton Glaser, Maira Kalman, Javier Marsical, Gary Panter, Rick Valicenti and Doyald Young are just a few of the contributors. 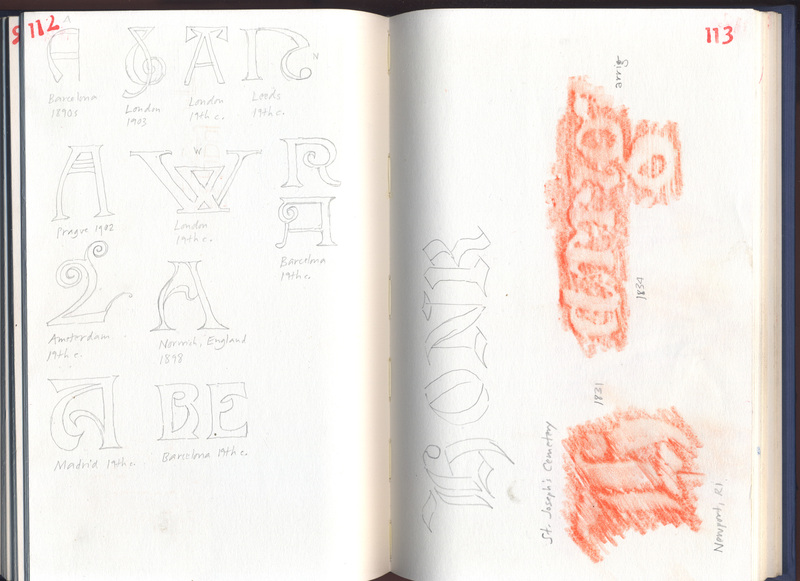 The emphasis in Typography Sketch Books is on two or more pages of extracts from each person’s sketchbooks. Not surprisingly, there is a diverse welter of styles and content. Some contributions are simple monochrome outlined sketches of letters, others are colorful collections of vernacular signage and comps for magazine covers. There are doodles, paste-ups, fully realized logos and headlines, complex patterns comprised of letters, scribbles and notes, rows of multiple ways of making a single letter, calligraphic experiments and more. It is this diversity of materials, tools, methods and content that make Typography Sketch Books so delicious to dip into at random. My own contributions are fairly sober: some tight drawings for Origins characters, including explorations of alternative ampersands; a chart created to help with spacing the characters of Kolo; early drawings of Kolo with notations both by me and my colleague Garrett Boge; some proofs of Kolo marked up by myself; and letters redrawn from Florentine rubbings that were one of the bases for Donatello. They provide intriguing glimpses into my design process but, unfortunately, do not give the reader a complete sense of the stages involved. That will have to wait for another book or another post to Blue Pencil. For now Typography Sketch Books is a tasty teaser. A few additional appetizers are appended here. 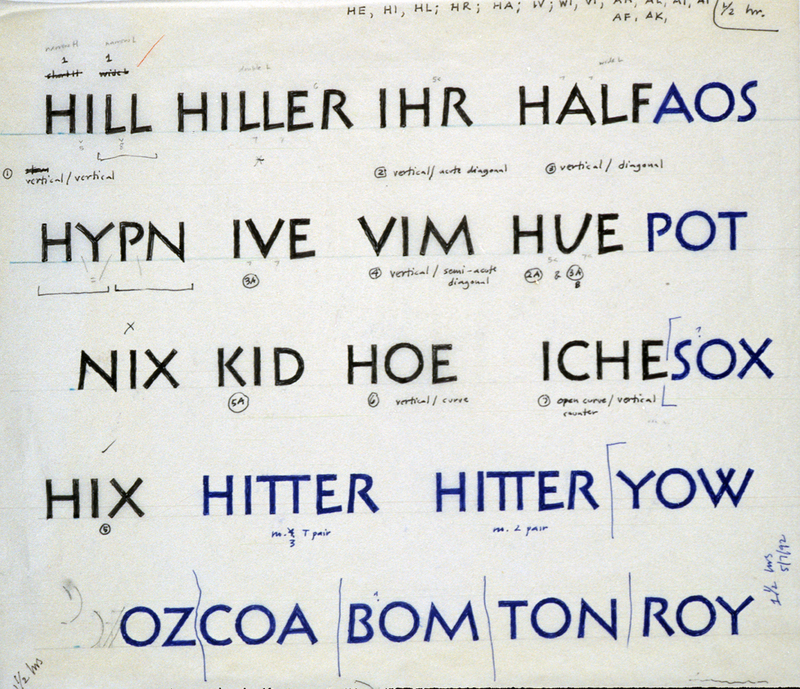 This is a spacing test done for Origins which is not included in Typography Sketch Books. It is a nice companion to my recent posts here and on Imprint regarding kerning and letterspacing. Here I was trying to establish letterspacing for basic combinations of adjoining letterforms: straight to straight, straight to diagonal, straight to curve, diagonal to curve, curve to curve and so on. In Typography Sketch Books I am quoted as saying that my sketchbooks tend to be “full of sketches of letters by other people rather than sketches of original letters or doodles. They contain drawings of letters I have found in books, libraries, museums, cemeteries, etc.… The purpose of the sketchbooks has been as both an aide-mémoire and as a resource.” These pages from Sketchbook 14 are an example of that: a motley collection of fascinating Victorian and Art Nouveau letters and figures on one page and two rubbings of 1830s gravestones in St. Joseph’s Cemetery (Newport, Rhode Island) on the other. This is a detail of a sheet of letters copied from inscriptions on various Quattrocento tombs in Florence. They were assembled from sketchbooks I made between 1991 and 1995 during trips to Italy. 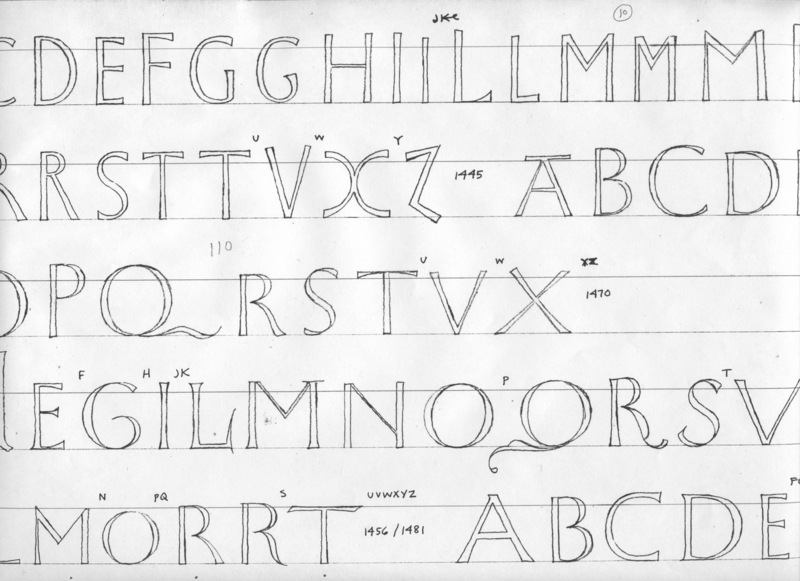 The letters were the ﬁrst stage in the development of Donatello and Donatello Alternativo. I used the collection of letters to see what the possibilities were for the typefaces and to choose a direction to pursue. Many of the letters were too narrow, too Medieval in appearance, too quirky, etc. Those that showed promise such as the dos-a-dos X were redrawn to a common cap height and then winnowed further in consultation with Garrett before serious drawing began.